RMAN is that a extreme powerful utility that can be used for many typical DBA Tasks, explore how great can be this tool for moving databases to Cloud. Enjoy watching! We hope the content could useful for your Oracle DBA Tasks! Subscribe to our Blog and enjoy our Weekly Cloud article..! Starting Oracle Database Cloud.. Where the DBAs are going to be working.. ? This is an interesting question.. yes or not.. ? Let our talent colleague Oracle ACE Director: Kellyn Pot’Vin-Gorman to answer it in a video of 2:43min. Enjoy!! At these times we are talking already about Oracle18c, however most of production systems are in 11g,, 12cR1.. 12cR2.. so.. We think you will love this material. Subscribe to get the notifications of our daily articles in your email..! A typical question I receive many times during the week is: “I’m DBA.. I have a lot of experience with “On-Prem” databases.. how I start with Oracle Cloud. Oracle 12cR2: Cross-Platform PDB Transport Using XTTS..!! Verify the prerequisites: The source PDB must be closed in MOUNTED mode and the COMPATIBLE parameter must be set to 12.2 or higher. Start an RMAN session and connect to the CDB instance of the PDB to be transported. For performing cross-platform PDB transport, you may need the exact name of the destination platform to which you are transporting data and may need to verify that the destination platform is of the same endian format. 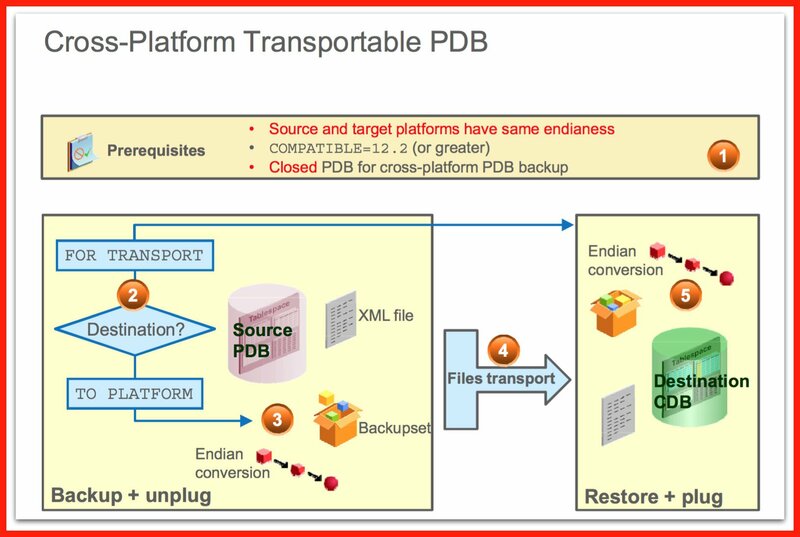 Back up the source PDB by using the BACKUP command with TO PLATFORM or FOR TRANSPORT. The new UNPLUG INTO clause creates the XML file containing the metadata of the PDB—tablespaces list, datafiles list, options, and parameters values. The FORMAT clause indicates the directory where the backup sets containing the data required for cross-platform database transportation are stored on the source host. In the first example in the slide, the conversion will take place on the source host and the files stored in the /bkp_dir directory are converted for the Linux x86 64-bit platform. In the second example, the conversion will take place on the destination host during the restore command and the files stored in /bkp_dir directory on the source host are not converted yet. Disconnect from the source CDB. destination host. You can use operating system utilities to move the backup sets and the XML file from the source host to the destination host. Connect to the destination CDB, to which the PDB must be transported. Ensure that the destination CDB is opened. Use the RESTORE command to restore the files for the newly created PDB to the target location, and plug the files into the new PDB by using the new USING clause. Oracle 12cR2: Cross-Platform Transportable PDB..!! Oracle Database 12.1 allows you to transport database or tablespace backup sets with conversion at source or destination for same endian platforms. Oracle Database 12.2 includes cross-platform PDB backup and restore into a CDB by unplugging at backup step and plugging at restore step as long as the source platform and destination platform have the same endian format. For a cross-endian migration, the tablespaces have to be exported and imported with Data Pump, either using the conventional expdp/impdp or the Full Transportable expdp/impdp. Before backing the PDB, ensure that the prerequisites are satisfied. Determine the location of the endian conversion. – The FOR TRANSPORT clause creates a cross-platform backup indicating that the backup set can be transported to any destination database. – The TO PLATFORM clause indicates that the conversion performs on the source database for a specific platform and can be restored on that specific platform. Use the BACKUP FOR TRANSPORT or TO PLATFORM command to create a cross- platform PDB backup set on the source host. The new UNPLUG INTO clause creates the XML file containing the metadata for the PDB. Use any operating system utilities to transfer the created backup set and XML file. Use the RESTORE FOREIGN command to restore the cross-platform PDB backup set on the destination host. The new USING clause uses the XML file to plug the appropriate files for the new PDB. Prepare the PDB to be unplugged and upgraded in another CDB by executing the same jar file as in the previous slide but only on the PDB. The fixup scripts and log files are generated in the pre-upgrade directory of the source database, in the $ORACLE_BASE/cfgtoollogs/SID/preupgrade directory. Execute the preupgrade_fixups_<PDB>.sql script in the PDB. Close the PDB from the 12.1 CDB to unplug it. Then plug it into the target 12.2 CDB. Open the PDB in the target 12.2 CDB in upgrade mode and upgrade it to 12.2. Finally close and open the PDB in normal mode. Use the catcon.pl script to execute the postupgrade_fixups.sql and utlrp.sql scripts. You can verify that all issues have been fixed by running the utlu122s.sql script. In case the PDB is migrated to an application root, shared objects can be marked as metadata-linked or data-linked by using the DBMS_PDB.SET_METADATA_LINKED or DBMS_PDB.SET_DATA_LINKED or DBMS_PDB.SET_EXT_DATA_LINKED procedures. The user responsible for the migration can be granted EXECUTE on the new DBMS_PDB_ALTER_SHARING package rather than on the DBMS_PDB package to avoid enabling the user to execute other DBMS_PDB procedures. Oracle Database 12.2 introduces a new instance parameter to control the Degree of Parallelism of queries, which involves a containers() construct. In the case of a query in the CDB root, the value is (1 + number of open PDBs). In the case of a query in an application root, the value is (1 + number of open application PDBs). Using the local UNDO mode is required when cloning a PDB in hot mode or performing a near-zero downtime PDB relocation or refreshing PDBs or using proxy PDBs. You can set a CDB in local UNDO mode either at CDB creation or by altering the CDB property. When the database property LOCAL_UNDO_ENABLED is FALSE, which is the default, there is only one UNDO tablespace that is created in the CDB root and that is shared by all containers. When LOCAL_UNDO_ENABLED is TRUE, every container in the CDB uses local undo and each PDB must have its own local UNDO tablespace. To maintain ease of management and provisioning, UNDO tablespace creation happens automatically and does not require any action from the user. When a PDB is opened and an UNDO tablespace is not available, it is automatically created. To get the same result as unplugging and plugging a PDB from a remote source CDB into another CDB, you can take advantage of the Oracle Database 12.2 feature such as near-zero downtime PDB relocating. In Oracle Database 12.1, unplugging and plugging a PDB requires several steps such as unplugging the PDB from the source CDB, copying the database files to a new location, creating the new PDB by plugging the source PDB at the target CDB, and finally dropping the PDB from the source CDB. A single DDL statement can relocate a PDB, using the “pull” mode, connected to the CDB where the PDB will be relocated to pull it from the CDB where the PDB exists, managing draining existing connections and migrating new connections without requiring any changes to the application. − When the newly created PDB is opened in read-write mode for the first time, the source PDB is automatically closed and dropped, and the relocation operation is completed with the relocated PDB being fully available. This is the “normal availability” default mode. − This method can be used to relocate application PDBs too. − The maximum availability mode reduces application impact by handling the migration of connections, preserving the source CDB in mount state to guarantee connection forwarding of the listener to the remote listener where the PDB is relocated. In this case, you cannot create a PDB with the same name as the source PDB because it will conflict with the listener forwarding. It is expected that connect strings are updated at a time that is convenient for the application. After this is done and all the clients connect to the new host without forwarding, the DBA can drop the source PDB. − If AVAILABILITY MAX is specified during the CREATE PLUGGABLE DATABASE RELOCATE command, additional handling is performed to ensure smooth migration of workload and persistent connection forwarding from the source to the target. The PDB is always first opened in read-only mode. This makes the PDB available as a target for new connections before the source PDB is closed. During this operation, listener information of the target CDB is automatically sent to the source and a special forwarding registration is performed with the source PDB’s current listener. New connections to the existing listener are automatically forwarded to connect to the new target. This forwarding persists even after the relocation operation has been completed, and effectively allows for no changes to connect strings. − It is still recommended that connect strings are updated eventually at a time that is convenient for the application, but availability is not dependent on when this action is performed. PDB relocation requires enabling the local UNDO mode and ARCHIVELOG mode in both CDBs. Cloning Oracle Database 12.1 PDBs to get a test PDB required the source PDB to be in read- only mode, which was nearly unacceptable on a production PDB. The new Oracle Database 12.2 technique copies a remote source PDB into a CDB while the remote source PDB is still up and fully functional. Hot remote cloning requires both CDBs to switch from shared UNDO mode to local UNDO mode, which means that each PDB uses its own local UNDO tablespace. In addition, hot cloning allows incremental refreshing in that the cloned copy of the production database can be refreshed at regular intervals. Incremental refreshing means refreshing an existing clone from a source PDB at a point in time that is more recent than the original clone creation to provide fresh data. A refreshable copy PDB can be opened only in read-only mode. If the source PDB is not accessible at the moment the refresh copy needs to be updated, archive logs are read from the directory specified by the REMOTE_RECOVERY_FILE_DEST parameter to refresh the cloned PDB. When we talk about Multitenant arquitecture, Upgrade is one of the many advantages using it. Let’s see how we can upgrade a CDB Including PDBs from 12.1 to 12.2. Let’s see how to do it..
To upgrade the CDB and PDBs from Oracle Database 12.1 to Oracle Database 12.2, use the DBUA utility or proceed with manual steps as described in the Figure 1. In step 2, when running preupgrade.jar in a CDB, make sure that all the PDBs are opened. The fixup scripts and log files are generated in the pre-upgrade directory of the source database, in $ORACLE_BASE/cfgtoollogs/SID/preupgrade. You can define a list of PDBs to upgrade either by using an inclusion list with the -c parameter or an exclusion list with the -C parameter. The output of the progressing operation is displayed by default on TERMINAL. The output can be a FILE or a directory (DIR). Finally the type of the output is either TEXT by default or XML. In step 4, use the catcon.pl script to execute the pre-upgrade SQL scripts in the CDB root and in specified PDBs in the correct order. It generates log files that you can view to confirm that the SQL script or SQL statement did not generate unexpected errors. It also starts multiple processes and assigns new scripts to them as they finish running scripts previously assigned to them. In step 5, remove desupported initialization parameters, adjust deprecated initialization parameters, and add new ones. Make sure that all path names in the parameter file are fully specified. In step 7, DBUA or catctl.pl automatically runs the Parallel Upgrade Utility. To upgrade a subset of PDBs within a CDB, you can specify either an inclusion list with the – c parameter or an exclusion list with the -C parameter. Use the -l parameter to specify the directory to use for the spool log files. In step 9, use the catcon.pl script to execute the postupgrade_fixups.sql and utlrp.sql scripts. Note: A prioritized list is used in any upgrade from 11.2.0.3.0, 11.2.0.4.0, 12.1.0.1.0, or 12.1.0.2.0 to 12.2. Default priorities are set to containers, with the CDB root being always upgraded first. The DBA can alter the priority so that PDBs are upgraded according to the configured priority order. In Oracle Database 12.1, when a PDB is unplugged, all the data files associated with the PDB along with the PDB manifest must be copied or moved individually over to the remote server where it will be plugged into another CDB. With Oracle Database 12.2, you can choose to create a single PDB archive file, a compressed file with the .pdb extension, which contains the PDB manifest and all the data files when unplugging a PDB. When plugging in a PDB, the presence of a .pdb file is interpreted and the PDB is plugged into the CDB. You can choose to run the PDB plug-in compatibility test directly on the PDB archive without extracting the PDB manifest file from the archive. This feature provides ease of managing the unplugging and plugging of PDBs across CDBs. or Subscribe to our Enmotech Blog! How Well a Query Optimizer Handles Subqueries? When we talk about a database, we think immediately in saving information.. and secondly in fetching information.. for the second one the backbone are the queries.. subqueries.. etc, if you are DBA or Developer.. We think this article is for you..
Read THIS.. Before Patching by April 2019..!! Oracle 18c: 26 Remarkable new features of Oracle Database 18c..!! Oracle Database 18c = Oracle Database 12c Release 2 12.2.0.2 ?? Oracle 18c: Oracle 18c.. New Features.. What’s NEWS..
Enmotech Information Technology Co., Ltd. / Copyright © 2009-2018, All rights reserved.